Awardicons are a wonderful way to recognize someone for a great writing, a unique item, beautiful portfolio or a job well done! Each awardicon is given by a member of Writing.Com for whatever reason he or she so desires. This is the ultimate form of recognition here at Writing.Com! Awardicons are ribbons or trophies that may be awarded to items or portfolios within Writing.Com. Each awardicon is custom-designed by Writing.Com with varying levels of uniqueness and price. 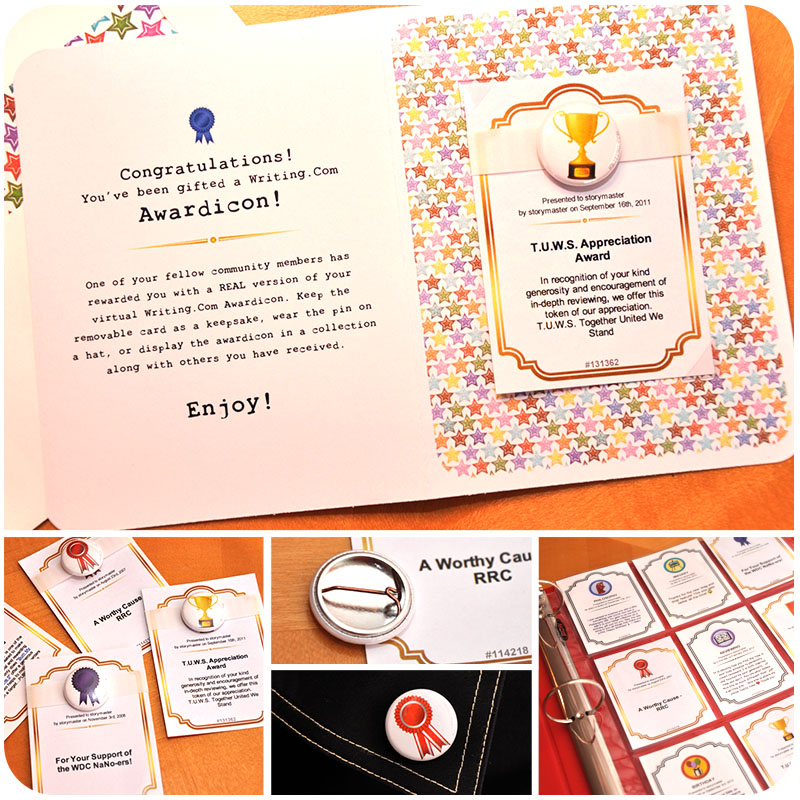 Award a virtual awardicon that is kept and displayed in the member's portfolio; mail a physical one to the member to keep and display at home! How do I give a virtual Awardicon? To purchase an awardicon for a member's item, you have a few options. If you are viewing the item, you can scroll to the bottom of it and purchase one directly from there. You can also choose Shop or Gift Point Tools from the left navigation under the Writing.Com logo. Both of these menus have awardicons linked from within (http://www.Writing.Com/main/awardicons.php). Copy the item's ID number or the member's username (for the portfolio), paste it into the appropriate text box, and write a simple message to explain your reasons for awarding it. How do I send a physical Awardicon? When you give a virtual awardicon, you also have the option to gift a physical awardicon that will be sent to the member by USPS First Class mail. The member will receive your gifted Awardicon in the form of a 1" button pin attached to a keepsake card (see photos below). The pins can be displayed as a collection or worn individually. The cards are standard sports-card size, so that they can be kept in a collection of sleeves. Each physical awardicon costs 25,000 "Gift Points" 1 each time you want to send one to another member. Click on the photo above to see examples of the physical awardicon. Your message should leave an impression as to why you chose to award it. This can be anything from the item ID of the original contest where the award was won to a well thought out message about the item itself. Do awardicons count toward my community recognition? If an item has multiple awardicons, how are they displayed? My personal thanks to the StoryMaster, creator of this wonderful place. A warm welcome to our newbies; come meet new and not-so-new members of Writing.Com! You can also override the default and choose the awardicon that will show at all times. Just click on an item's awardicons, page through them and choose one to set as the default at the top of the its screen. Can I give an awardicon to a member? Yes, you can award a member's portfolio with an awardicon. Just copy the author's username for the text area when you choose the awardicon. How can I view someone's awardicon? Clicking an item's awardicon will launch a small window containing its larger awardicon image, the name of the member who gave the awardicon and the reasons behind it. Trophies and plaques allow members to leave special, personal inscriptions for the item, while ribbons do not. How can I view my items' awardicons? Each Writing.Com item has an awardicon display case, where all awards received for that item will be stored. Each time the item receives an awardicon, it will automatically be added to the item's display case. When viewing an item, readers may click on the awardicon to peruse the item's display case. A small window will appear allowing the viewer to look through the awardicons from highest to lowest value. Where can I view all of my awardicons? Each Writing.Com author has a trophy room, where all display cases are stored. This means, each item that has won an awardicon will be seen from this room. Members will access an author's Trophy Room from the author's public portfolio "Community" tab. Can I display awardicons in my signature? Yes, by using WritingML, you can quickly and easily add an awardicon (or more) to your signature. Please read WritingML Help for award. Can I download them to store in my portfolio? No, you may not download the awardicons. Each awardicon is owned by Writing.Com and may not be used for personal use. There are many tools provided for displaying them without having to actually download or manipulate them in any way. Where can I view all of the awardicons that have been given out within the community? Where can I view all of the awardicons that I have given out to other members? From the Gift Point Tools link in the navigation under the Writing.Com logo, click on Awardicons: Given. This will display all of the awardicons that you have given within the community. Can I give myself an awardicon? No, awardicons may only be given to other members' items. Will my mailing address be made public to other members when they send me a physical awardicon? No, your mailing address will always be kept private and only used by the system to generate a mailing address when your physical awardicon is assembled and shipped. Only Writing.Com Staff will see this information. Can I order physical awardicons for ones I've already received? Yes! If you would like to order a physical awardicon for one that you've received, visit your Awardicon area and click on the awardicon you want to order. From the window, click the Order Awardicon button at the bottom. Can you ship a physical awardicon for a virtual one I've already given to someone? Yes! Visit your "Given" awardicon area and click on the one you want to order for the member. From that window, click the Order button at the bottom and we'll take care of the rest! Is there a bulk order option for badges and awardicons that I've already received? If you are interested in ordering all of your previously-received badges and awardicons in bulk instead of individually (minimum 50), email The StoryMistress to discuss the options. Since we would be assembling them all at the same time and shipping them to you as a package, we would offer them at a discount, dependent on how many you've received. How long will it take for the physical awardicon to arrive? Allow up to two weeks for assembly and delivery. USPS first class mail is generally 2-3 days for US domestic mail. International delivery varies based on location. Is there a different fee for US and international mailings? At this time, all orders are the same price, regardless of delivery location. Does a physical awardicon affect community recognition? No, a physical awardicon does not count toward community recognition at all. Can I send a physical awardicon without sending a virtual one? No, the physical is an extension of the virtual. What happens if the member doesn't have his or her mailing address in the account? When you order a physical awardicon for a member, the system will automatically email him or her to request a physical mailing address. Members have up to two weeks to supply their accounts with a current mailing address. After this time, if no address has been input, the system will refund your Gift Points and no physical awardicon will be mailed. I received an email that someone gifted me a physical awardicon, but it hasn't been delivered by USPS yet. Now what? To keep costs affordable for everyone, we mail physical awardicons by USPS First Class Mail. Since this method is inexpensive, it does not include tracking or delivery confirmation. Once your awardicon order leaves our hands, it is in the hands of the postal system. If you would like to reorder your awardicon, choose it from within your awardicon page and click the Reorder awardicon button at the bottom. I received a request for my address and I don't want to give it. How do I opt out of these? On your personal information page under Shipping Preference, choose the "No" option and members will not be able to send you a physical gift. Just like "Costumicons" and "Merit Badges" , awardicons are sponsorships that help support Writing.Com. If you have a "special" awardicon that you have given more than once, keep a running list of those items and their authors at the bottom of your "special" item. Perhaps your award will be known throughout Writing.Com and coveted by all. Add some life to your contests by giving away an awardicon for each winning placement. Combine this with Gift Points and you've got instant cool prizes! Awardicons are not supposed to be "under priced" because they would quickly appear on every item and lose their value. Awardicons stay with an item forever. Once your item has received an award, it will keep this award by its side as long as it's on Writing.Com. In the event an awarded item is deleted, the Community Recognition count received from the item's attached award will still remain in effect, though the award itself will no longer be visible. More than likely, items that receive an award will stand out much more on an item listing page. Over time, they will probably stand out so much more that they are worth their "weight" in saved BidClick fees. Qualified Awardicon totals are calculated once per hour. 1 The price for a physical awardicon is subject to change without notice. Generated in 0.91 seconds at 2:34am on Apr 20, 2019 via server WWW1.